This is a customer experience story, a health scare, a journey that started in despair and ended in triumph. It’s also a stellar story about corporate culture and a company’s mission coming together to truly serve the customer. Truth. I experienced significant health issues this summer. Hard to admit. In addition to missing a lot of work and important family events, I felt isolated. Being vulnerable is a huge challenge for me. Because, well, I consider myself a strong person, one who can handle the hurdles in life. At least I like to project that to the world. I was in the ER twice, endured a lot of pain, and went through four tests at Northwestern Hospital in August and September. It was scary. The worst part? The symptoms and test results presented the healthcare pros with a mystery. Gut issues. I will spare you all the details, but it was serious. Because I had no answers for almost two months, I feared the worst. Three weeks ago, I traveled north to Rochester, Minnesota to get some answers from Mayo Clinic, ranked #1 in the nation. What happened next surprises me in ways that are difficult to express, especially if you’ve never been to this magical place. 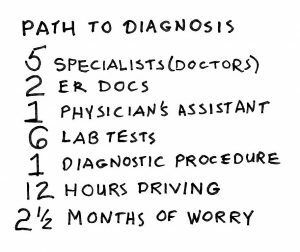 After 72 hours, three physician visits, three lab tests, and one diagnostic procedure performed by an expert team of docs and technicians, I received a diagnosis. Two conditions that can be treated by diet: fructose malabsorption (yes, it is a thing and there are worldwide support groups!) and acid reflux. The treatment for these conditions conflict with one another, which made the diagnosis and suggested plans more complicated. The integrated team approach made it possible to create a plan. Bonus news: my overall health is positive because the team ruled out many of the diseases that worried me. The most amazing part of this story, however, is not the diagnosis. It was the extra special care and service delivery from the time I checked into my hotel until the time I left Rochester three days later. Everyone that interacts with patients treats you with genuine kindness. From the hotel bus drivers to the people who check you in, to the workers who sweep the hallways at the clinic. To inspire hope, and contribute to health and well-being by providing the best care to every patient through integrated clinical practice, education and research. Provide an unparalleled experience as the most trusted partner for health care. Musicians who donate their services play music every day near the cafeteria and other areas: classical quartets, country music, jazz musicians, and piano solos are examples. Volunteers with blue vests roam the hallways asking if anyone needs any help. There are signs in every waiting room letting you know the goal is to minimize wait time. If you wait longer than 15-30 minutes the registration team requests a gentle reminder from you. I never waited longer than that. Wow! People who go to Mayo Clinic are sick and have often been suffering for awhile before making the trek. Yet, the patients don’t looked stressed in the waiting rooms. And guess what? The medical pros listened and collaborated with each other in pursuit of identifying my mystery condition. The care at Mayo is integrated and treats the whole person. The scheduler works on your multi-day timeline within 30 minutes of the doctor visit. Your dedicated assistant provides a printed itinerary packet. The package contains a thorough schedule, testing preparation instructions, and directions to campus buildings. All hotels (and there are many), provide shuttles running from the hotel to the Clinic campus every 30 minutes. No need to use your car once you arrive in Rochester. Empathy and understanding are present in every person’s eye contact. My eyes were brimming with tears several times. I had never witnessed this level of genuine care in a medical facility. The scheduler hugged me when she noticed I was about to cry. Grateful tears. When a procedure required sedation, a volunteer walked me to the lobby. A bus dispatcher put me on the right bus. The bus driver delivered me safely to the hotel. Prior to arriving in Rochester, I felt my questions were ignored. My concerns were minimized. No one seemed to care if my condition worsened or that it took three months to secure a specialist physician appointment. Tests and lab results were ready within hours of test completion via the patient portal. Contrast this to days and weeks in a typical environment. The empathy model is in full effect at Mayo Clinic. Many corporations could learn much from a place that truly cares for customer needs. Mayo is #1 in the country for a reason. There are Mayo Clinics in Arizona, Florida, and Minnesota. If you ever have something serious, or you simply want to be heard in your quest for answers, check these locations out. If your insurance covers your local doctors and hospitals, they may also cover Mayo. But call to confirm! When I called my insurance company, they treated it like any other doctor or hospital visit. We hear so much about the importance of corporate culture, yet how often is it a top priority in your job search? Or health provider search? In summary, this impressive experience taught me some important lessons. Integrated communication and thinking, rather than silos satisfiy customer needs. Empathy rules the day; taking time to understand your customer point of view and collaborating with them solves problems. Thoughtful service delivery and kindness make it painless and easy for the customer.